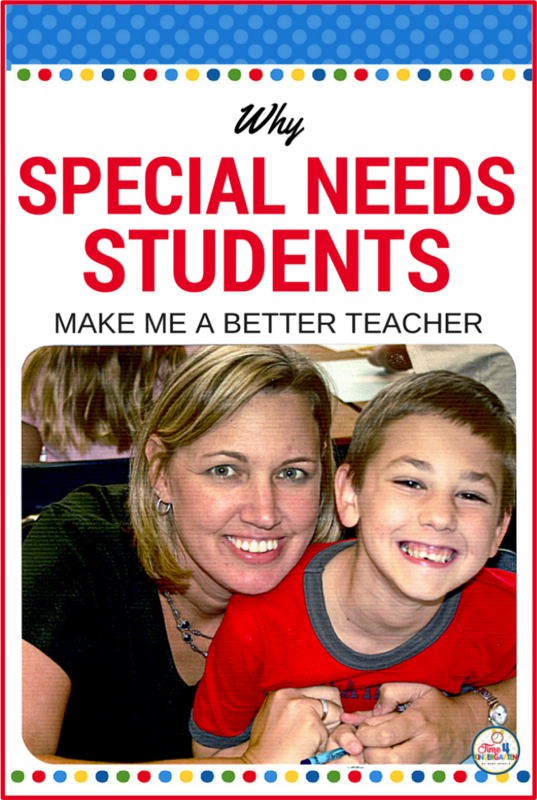 Over the years I have had many students in my classroom with special needs. Many of these students had a diagnosed learning disability. Other students had an array of diagnosis; ADHD, autism, down syndrome, spina bifida, speech and language processing disorders, a delay of fine and/or gross motor skills, visual impairments, and cancer. For some of my students they may have had up to three of the labels listed above. As a general education teacher, I wasn't prepared for teaching students with special needs or disabilities within the mainstream classroom. When I reflect back to my student teaching experience, I wonder if any of us are really prepared in our teaching programs for the "real" classroom. I know I wasn't. With education reforms continuously changing, I am seeing a large number of students with special needs being placed within the general education classrooms. In fact, many distracts have even eliminated some of their special education classrooms to further the integration process. The idea of integrating special needs students can be disconcerting for parents and teachers. Especially for the parents who have a child without special needs. They often feel that their child may be overlooked or that the teacher will be focussing more on the child who is disruptive or who needs far more help due to their other disabilities. Yes, there are times when I need to focus on my students who have special needs, but I assure you, I focus my attention on your child too. I make it a point to get to know my students and what they all need. There are so many positive opportunities and benefits to gain from placing the students together. Increased interactions with peers, leading to greater opportunities for friendships to be made. Access to role models for social, academic, and behavior skills. Increased opportunity for parents to participate. Greater opportunities to achieve and exceed IEP goals. The general education students can serve as peer role models for social, academic, and behavior skills. Students learn to ignore, tolerate and accept the inappropriate behaviors. Increased acceptance and understanding of differences and diversity. Opportunities to learn from others or master skills by teaching other students. My very first year I had 2 students who were ADHD and medicated and one with violent outbursts. To this very day. I still worry about the one with the outbursts. His life had been a tragic story from the time he was born. When I had changed schools he was at my new school. I followed his story until he moved away about 10 years ago. From time to time we hear about him. He will always hold a place in my heart. The teaching credential program did not prepare me for working with ADHD students and it certainly did not prepare me for the emotional effect some children would have on me. Some of my most challenging students have been my autistic students. Trying to find ways to communicate with students who are non verbal and who do not sign can be very frustrating, especially if the student is having a complete meltdown in the middle of the classroom and their assistant has gone to lunch. Luckily for me, I have trained my class on what to do in case of a Teacher Time Out. This is when the teacher needs to take care of a situation therefore the teacher is unavailable. My class is expected to go to the carpet and read from the library bin quietly. So, there I sat in the middle of my classroom, holding my student until he was calm enough to show me what was wrong. I was able to figure out that he couldn't snap his shorts after using the bathroom. We were able to snap... and move on. Another student I have had the pleasure of having in my 3rd grade classroom was Nick, who had been diagnosed with high functioning autism. I had known Nick since kindergarten. As teacher in charge, Nick and I spent a few times together here and there before he reached my classroom. 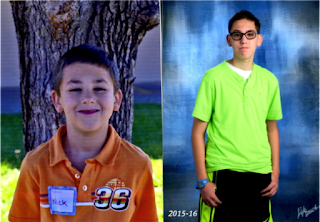 His mom and I had become friends and I knew I would be the best teacher for Nick. I convinced our principal to place him in my room. When he wasn't napping in my classroom library he would be pacing in circles in the back of the room while reading about World War ll. In 3rd grade Nick was reading at an 11th grade level. Motivating him was challenging. Although he loved to read, he hated to write and he had convinced himself that he wasn't good at math, even though he actually was. I was able to entice him with frequent breaks with a friend or a nap. This kid loved to nap. His mom and I have remained friends. Over the years, I have enjoyed watching him grow into a typical teenager, glued to his phone and video games. It is hard to believe he is already a sophomore at our local high school. Today he excels in history of course due to his passion for reading and umpires the local little league games. As teachers we aren't supposed to have favorites, but I love my special needs students. They have truly made me become a better teacher. I see them as a puzzle that I'm trying to solve. I'm always looking for another way to make learning more accessible for them or even find a way to just engage them to participate. Maybe it is the challenge that I like or maybe it is just the sheer pleasure I get when I see their little faces light up when they have accomplished something that might be so simple for others. Whatever it is, I know that these are the students that keep me on my toes. They are the ones that make me think outside the box. It is because of them that I am always coming up with new ways to do things. If it makes their life easier and learning more accessible, then it is really making my job easier too. This year I have a very special student who is one of the kindest students I have ever had. He is also a firecracker of nonstop energy and oh soooo smart. I am always upping my game to get him to focus and complete work; enticing him with the iPad or some other item he has deemed "break worthy". The other day I was really frazzled and not feeling well. He stops, puts his hand on my shoulder and says "Mrs. Mugurussa, how was your day?" Melt my heart. Here is that puzzle, I'm talking about. I want to know what made him stop running around my room and notice that I was about to lose it. What six year old has that kind of insight? It was his simple gesture and sincere compassion that made me stop, take a breath and compose myself before moving on. He made me realize that it wasn't the students that day, it was me. They challenge my patience. I have learned to pick my battles, I decide what is important and let the rest go. They make me think out of the box. If something isn't working, I will modify and adjust until I can find a way to get through. If it is just too much. Then we move on and save it for another time. They challenge my creativity when it comes to planning lessons. I am always searching for new ideas that include hands-on, technology, and music. I know that almost every student will find lessons with these modalities engaging. I need to be creative with my assessments. If they are unable to take an assessment in the traditional manor, then I'll develop an assessment that will meet both of our needs. As long as I get the data I need to show they are achieving, it doesn't really matter how I get it. My students with special needs are the students I remember the most, they are the ones that stay with me. They are the ones that keep me up at night. I consider myself lucky to have had the opportunity to be their teacher I have learned so much from them. Thank you for letting me be your teacher, thank you for teaching me. love your enthusiasm for teaching!!!! Especially the special needs kids, that most teachers shutter to have in their room. I know that you made a HUGE IMPACT on Nick's life and am forever grateful to you and the other small handful of teachers that helped push him (albeit kicking and screaming sometimes) to where he is today. I am glad you love your students with special needs so much! As a teacher in a school for children with special needs and parent of a child with special needs. I definitely identify with that love. I have one thing to point out. A child is not autistic s/he is a child with autism the same way a child is not strep or a cold, s/he has a cold or strep.